Experiments have shown that prisms shaped like Australia would still work. Australian Pink Floyd are a real band. They just so happen to be vaguely similar to a British band called Pink Floyd (hereafter referred to as the British Pink Floyd to avoid confusion) meaning people sometimes mistake them for a tribute act. But what tribute act makes 7 million AUS Dollars a year and sleeps with a different sheila every night? They sell out 35,000-seat arenas over three consecutive days, can Elvish Presley or the Rolling Clones say that? No, no they can't. The band even have their own successful merchandise line, which, whatever the rumour says, is not just a box of unsold Pink Floyd t-shirts that have been resprayed. Furthermore, the Australian Pink Floyd and the British Pink Floyd are completely different. For instance, British Pink Floyd had a big hit with the song Wish you Were Here, whereas Australian Pink Floyd's equivalent hit was the strikingly different Australian Wish you Were Here. 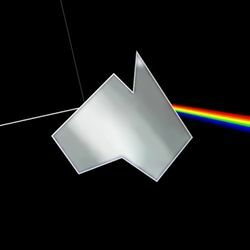 Aussie Floyd are a band in their own right, despite the implication in the name that they're just an Australian version of the other Pink Floyd. 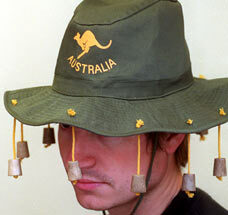 However, in the words of Barry Wozzer, "They're more of a British version of us". Barry Wozzer plays David Gilmour guitar in the band. That's not a stage show, this is a stage show. In 1988 British Pink Floyd's Australian representative, Bruce Bozzer, realised he wasn't making money off them anymore. There were several reasons for this. Firstly, the band had effectively broken up and had stopped touring or doing anything at all. And even when they did, it required a stage show so extravagant that even the best selling album of all time had no hope of recouping the costs. Bozzer was also tired of their substance abuse (the band were allegedly taking tea breaks every 15 minutes) and their constant bickering (rock legend states that strongly worded letters between the band members were at an all-time high). "They're a bunch of British ponces," Bozzer told the press. He decided to put together a more Australian Pink Floyd, and thus, Australian Pink Floyd was born. In their humble beginnings they were an ordinary covers band, competing for stages with fellow homages Pink Fraud, Think Ployd and Samoan Pink Floyd. But Australian Pink Floyd quickly outgrew the tribute act scene, and became a band in their own right. Unlike most tributes, they didn't simply imitate the original band, but instead copied their songs note-for-note and recreated their light shows with impeccable accuracy. The band was a hit, and even Roger Waters, formerly of the British Pink Floyd, said they were "better than the real thing," by which he presumably meant his own band, although this hasn't been confirmed. 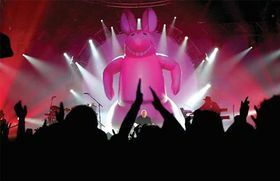 Waters even started incorporating elements of the Aussie Floyd's performances into his own sets; most notably the giant inflatable pig, which was clearly based on their iconic inflatable piggeroo. In 1998 the Aussies played their most prestigious gig yet, performing for David Gilmour on his 50th birthday. Gilmour said they were the best Pink Floyd tribute band he'd ever seen. The same year, Barry Wozzer also watched a load of old tapes of British Pink Floyd playing, and returned the compliment by saying they were the best Australian Pink Floyd tribute band he'd ever seen. Despite their success however, the band are still tragically overlooked by critics and by the music community at large. It has been speculated that this is a result of anti-Australian xenophobia, or perhaps due to them being mistaken for the lower-quality British Pink Floyd. They are commonly passed over in favour of other bands who aren't even as good, such as at the 2005 Glastonbury Festival when they unfairly had to play second on the bill under Stevie Wonder, who is nowhere near as famous as them in Australia. The fact that they headlined Australian Glastonbury was little consolation, because the entire crowd was just a couple of surfers having a barbecue. All in all it's just another chain-link in the rabbit-proof fence. Unlike British Pink Floyd, Australian Pink Floyd are known for their lengthy psychedelic guitar solos, elaborate sound effects and the progressive nature of their songs. Technically speaking British Pink Floyd used to be known for these things too, but that was like 30 years ago mate; get over it. Besides, there is one key thing that Australian Pink Floyd incorporate into their music that British Pink Floyd never did; and that something is humorous Australianisms. Australianisms such as kangaroo imagery, excessive beer drinking during performances and the substitution of slide guitars with didgeridoos. There really is nothing like a ten minute psychedelic didgeridoo solo to get the crowd going. You can see them in the stalls; playing the air-didgeridoo like there was no tomorrow - and that's not a euphemism. 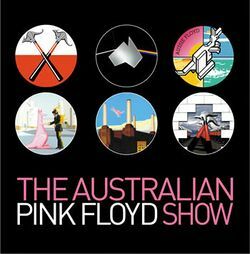 The Australian Pink Floyd play Pink Floyd songs as they're intended to be played, if the British Pink Floyd want to remove the Australianisms then that's their loss. Occasionally they will do things in a more typically Australian style, however, such as their rendition of Shine on you Crazy Diamond, which is performed entirely on a wobble-board and retitled Shine your Crazy Diamond Down, Boy. Lead vocals are performed by Rolf Harris. British Pink Floyd were often criticised for their "lack of kangaroos"; something Aussie Pink Floyd have never struggled with. For those without comedic tastes, the so-called experts at Wikipedia have an article about Australian Pink Floyd. "Why do people keep calling us the Australian Pink Floyd? As if we're not the real thing! We became Pink Floyd when we killed the original band in 1988!" This page was last edited on 30 June 2012, at 03:33.